A colorful addition to any backyard, garden or pathway. 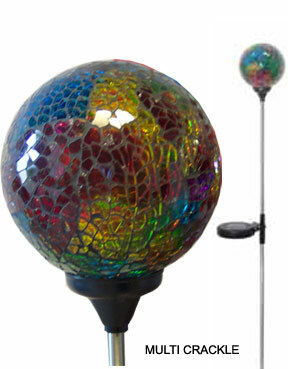 This 33" high garden stake features a glass mosaic globe supported by a sturdy metal stake. 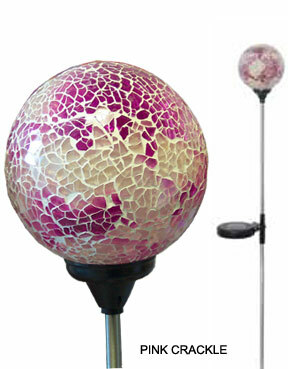 The interior of the globe is illuminated on the interior by a super bright LED light that turns on and off automatically. These stakes are solar powered and equipped with a darkness sensor so once you put it in the ground, your setup and maintenance is done. The sun will charge the included battery during the day, and the unit will automatically turn on during the night and then back off when it gets light out. A single charge can provide six or more hours of continuous light. This model garden stake features and always on, clear LED light on the inside. 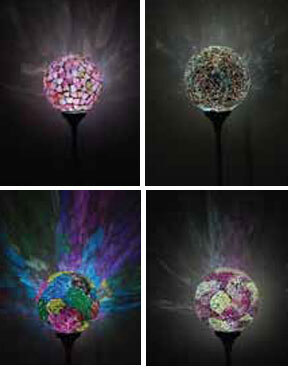 We also carry a color changing model that offers a more dynamic lighting effect. If you would like the ability to choose between a color fading light or an always on light, then check out our Color Changing Garden Stake Lights. The colorful accent lighting produced by these stakes is truly amazing. The beauty provided by the stake alone is a great decorative addition to any yard or garden thanks to the high quality components, but the addition of the solar powered LED light only adds to the appeal. The colorful glass mosaic will shine, reflect, add color and otherwise decorate your yard during the day time, but at night, when the light turns on, it becomes an even better. The bright light will shine from inside the globe to create a whole new effect while it illuminates your yard and provides useful, colorful lighting. That's why adding one of these garden stakes is the perfect way to improve the look of your backyard and add some light at the same time. 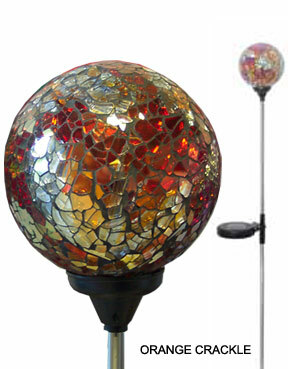 The mosaic glass that makes up the globe at the top of each stake serves to intensify the lighting effect and add a playful splash of color to virtually any area of your yard. They look great during the day, but as soon as it gets dark they transform into something incredible. The beautiful colored light created by one of these stakes is sure to enhance any outdoor space. Because it is just a stake and has no cords, you can place this LED Garden Stake anywhere in your yard that will allow you to stick in the ground. Accent your landscaping, illuminate a path, or just add interest to a certain part of your yard. These elegant stakes are sure to be a conversation piece and the envy of your friends and family members. It doesn't need to be plugged in or wired in any way, so once you find the right place, your set-up is complete. Each stake comes with a rechargeable Ni-MH battery pre-installed to power the super bright LED light in the interior of the glass globe. Get a single stake to add a stunning focal point to your yard, or purchase multiple stakes, and arrange them together for a spectacular display. Order Yours Today! Globe Dimensions 4" x 4"
Solar Powered LED Garden Stake - The perfect way to add colorful accent lighting to your yard, garden or pathway. The sun charges the battery during the day, and the garden stake automatically turns on when it gets dark. my sister loved it and said it was beautiful after being in the sun for 2 days.this was the mosiac globe.i will probably order another one for myself the price was amazing considering hoe pretty it is.